Trains are the toy of choice at our house. Our oldest loved trains from a young age. And I mean he LOVED trains – we have even bought him the scenic train videos that show trains for hours on end – and he actually sits there and watches them! So it is really no surprise that our other two boys love trains. I mean, they didn’t really have a choice. 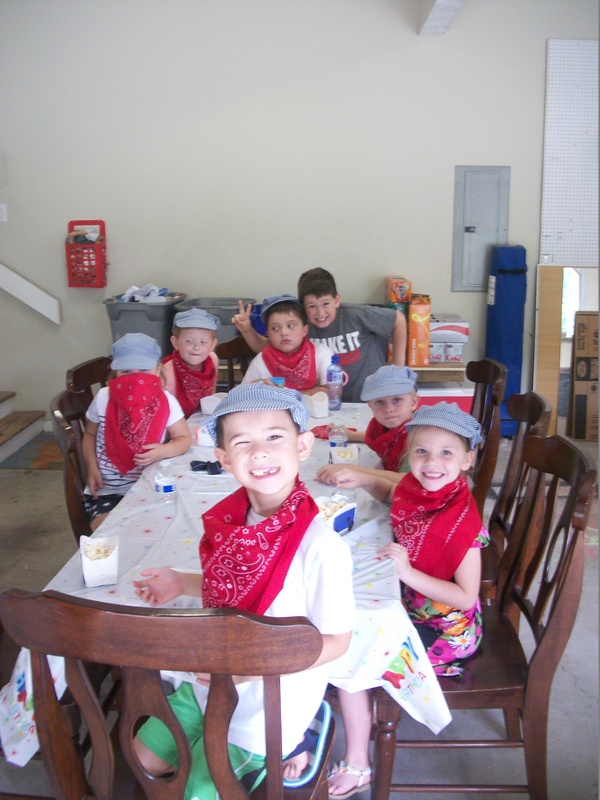 So when it was time for #2 to have his 6th birthday party, the theme was (wait for it) Trains!!! He happens to still adore Thomas, but I thought it might be better to have a generic train birthday since he is entering the age when his friends think Thomas isn’t cool. On the one hand, I don’t want him to be worried about being “cool,” but on the other hand I didn’t want to subject him to potential teasing. Since he didn’t really care (and I didn’t really ask him! ), generic trains it was. Generally speaking, I think it is a good idea to have an activity for the children to do while they wait for everyone to arrive. On this table (which would later be used to serve the pizzas) I set up a snack station. As each child arrived, he could pick one of the little freight cars to decorate. You might recognize it as the paper plate treat holder that is all over Pinterest. Once decorated, they served themselves popcorn to snack on. I’m a big believer in using food to appease the masses! You will notice that I just wrote a train track on a dollar store plastic table cover using a sharpie. Simple and efffective! I really didn’t want this party to be a point of stress for me, so instead of setting up an elaborate train set for the kids to play with, I just brought up #2’s portable train set, and the kids were happy to just go in circles. In a last minute decision, I decided to put together the IKEA lemonade stand that I had stored in the garage. It ended up being the hit of the party. I had several games planned, but the children were completely engrossed in “selling” popcorn refills, train tickets, and water bottles, that they really didn’t even want to play the games. Unwisely, I decided to play two of them anyway, and ended up with children in tears since only one child won a prize for each game. Lesson learned: do without the games! I kept the entire menu simple: popcorn for snack, pizza and apple slices for lunch, and ice cream sundaes for dessert. I didn’t think to get a photo of the dessert train before everyone dug in, so it is a little messy. But let’s be honest, by this point in the party, nothing was neat! And last but not least, I had a treat bag for everyone who came. I have an addiction to buying things in bulk (I like the idea of saving money: “But honey, I know it is $50 total, but each one is only 10 cents! !”) So I have a significant quantity of these super cute kraft coffee/bakery bags! I drew a little track around the window and wrote each child’s name in between the railroad ties. I had purchased some train cupcake toppers from Michael’s on clearance and removed the toothpick. I am sure train stickers or similar would be a fine substitute. I don’t like to spend a lot of money on treat bags because most of the time the kids just go home and throw it out anyway. I included a sheet of stickers (freebie ones that I always get from the Highlights people or Family Circle! ), dollar store bubbles, and some candies that I made with candy melts in molds that I already owned. The one big splurge was for the conductor hats and bandannas – each cost a dollar. All in all, it was a great party. Even though it went really well, though, I think I am going to continue my unspoken rule of birthday parties only once every 5 years! It might have been a relatively low-stress affair and only 2 1/2 hours long, but boy, it wore me out! I love trains, I love you, and I love this party! Thanks, Megan! You are my first comment!! Love this going to steal your ideas for the classroom! Laura – sounds great to me! Thanks for visiting! love love love this idea! Mitch was my little train boy and still is! We decorated his room all in trains and I had a wooden quilt up in his room with red bandana and blue and white train ticking fabric. 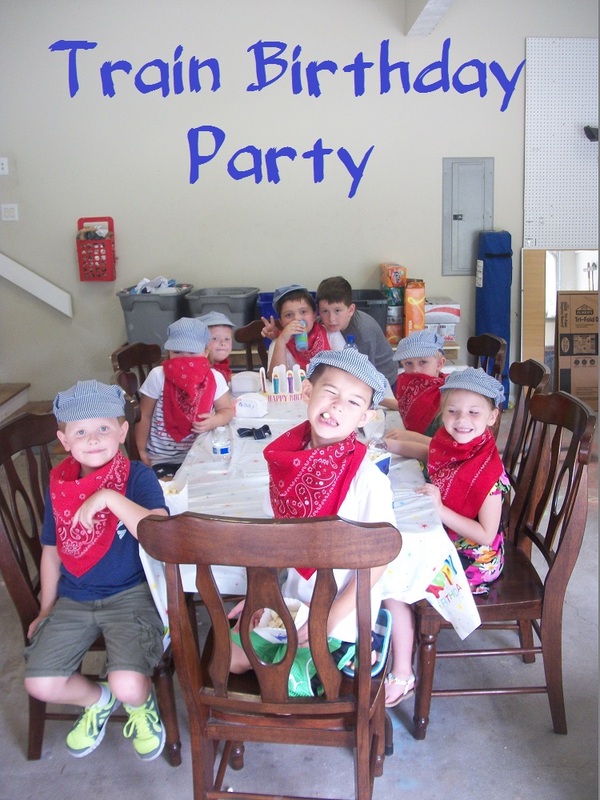 LOVE your party idea and putting engineer hats and bandanas on all the kids. Jesi, thanks for checking out my blog!! !